jurassic world | Troy C. Wagstaff aka CallahanWriter Blog: Topics of interest include Western Historical (1865-1899) Topics. Additionally inspirational Christian and Fibromyalgia interests. I went to see Jurassic World this evening with my daughter. She was taking me on a date for a father’s day gift. Ya, she’s awesome. I enjoyed the movie. We didn’t see it in 3D thankfully. I was overwhelmed with the traditional 2D viewing, because something happened while I watched that great movie. All the big scenes and noise and motion and wide shots were a lot of visual stimulation. I didn’t notice it at first, but then after a while I was getting a small headache. My eyes got tired and I felt over stimulated. I know I’m getting old, but I think it may be related to fibromyalgia and the related sensitivity issues. I don’t see any 3D movies anymore because they are verifiably hard on my eyes and head. But now the big concept, big scenes type movies for the summer are coming out and I worry that I may not be able to see them. I really liked Jurassic World, and I did see the original Jurassic Park. To me they are two different movies with a similar theme. The movie got me hooked and I stayed the whole time. But now it seems that parts of me like my eye’s, neck and brain are still coming down off that sensory roller coaster I was just in. Have any of you had that problem with big movies with a lot of noise, action and big scenes? 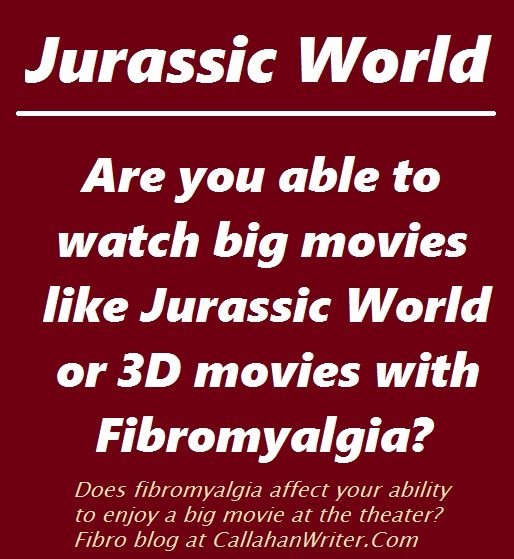 I wonder if it is related to chemical and light sensitivity that fibro is known for? What do you all think?